When I was a kid growing up in the 80s, I remember our first computer was an Atari 400. The console had a keyboard built into it, and it had a top loading slot where cartridges could be inserted. The back of the unit had a serial port for connecting peripherals. We had the Atari 410 tape drive that used audio cassettes to record programs and save files, but you could also buy software on cassettes. As crude as this hardware is in comparison to today’s technology, I still think that it was rather brilliant to store software on audio cassettes…but I digress. Despite the 410’s aforementioned brilliance, it had one major deficiency…it was slow. I remember that my Mom and Dad had bought me this Mickey Mouse game on cassette, and nobody could ever figure out how to get it to load. Eventually the cassette/the 410 tape drive where dismissed as being defective. One day, in an attempt to curb my growing boredom, I decided to connect the 410 tape drive and give the Mickey Mouse cassette another go. Having exhausted all of my cartridge games, the only game I hadn’t played was the Mickey Mouse game. I put the cassette in, rewound it, and pressed play. The tape played through, and the stopped at a certain position. This was the same result everybody else got when they tried to get this game to load. After 15 minutes looking at the cursor on the screen nothing had happened. By this time I had drifted away (daydreaming). I was probably thinking about how great it would be if I could actually play this game. After about 45 minutes to an hour the Micky Mouse game had loaded, and the iconic mouse’s face was displayed in 8-bit glory on my screen. As it turns out, there was nothing wrong with the 410 or the cassette holding the software, but rather the machine was so slow that this was how long it took for the program to load. Everybody had been so used to the nearly instantaneous load time of the game cartridges that nobody thought that it would take longer for the tape to load. Granted, I found this out by accident, but I learned a valuable lesson that day…have patience. All good things come to those who wait. I relay the above childhood story only because I think it directly relates to the next portion of this article. 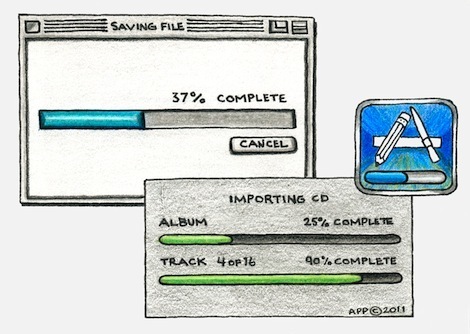 Progress bars, download windows, CD import screens, and loading screens are ubiquitous in modern day computing. Irrespective of what computer, gaming console, tablet, netbook, or smart phone that you have…progress bars will be familiar to you. Whether or not you ignore the progress bar, or you eagerly watch it in anticipation for your download/process to finish; the progress bar has an impact on your computing experience and on your life. After recently downloading a 1.49 GB file, I started to reminisce about how waiting for computers has affected my life. I remember when I had a Pentium 100 MHz PC in 1996 that had a 28.8 baud modem that would download at 2.8 Kilobytes per second. Downloading even the smallest of files from the internet was a time consuming and unwelcome chore, but most times I would simply zone out and think while the file transfer was being received. Downloading gave me time to organize my thoughts, and think deeply about various things–mostly school work at that time. Fast forward to today where I’m able to download at 768 kilobytes per second, and I only really have to wait when I’m downloading files that are in excess of 500 megabytes. Now waiting for downloading/loading is almost a thing of the past because there really isn’t much waiting to be done–with the exception of some PS3 games that load files to the PS3 hard drive. Computers and broadband internet have gotten so swift that you only get the opportunity to think when downloading really large files. I might seem out of date with today’s generation that expects everything that is computer/internet related to be performed instantaneously, but I think that something is lost with everything being so expeditious–not that I want to go back to 28.8 baud modems. This relates somewhat to my having read Nicholas Carr’s “The Shallows.” I have written a review about “The Shallows” in a previous post so I won’t go into it in detail here, but Carr’s main thesis is that the rapid pace of information technology is ruining our brains’ ability to think deeply and thoughtfully about something for a prolonged period of time. While I agree with Carr on many points, I would argue that progress bars and having to wait for a process to finish could be our last bastion of hope in salvaging what is left of deep cognitive thought. The progress bar reminds us that in order to get something we have to be patient; something that I think is totally lost on many in our postmodern times. I find this quite important because it proves that technology merely aides us to achieve efficacious results. That the real work is still done by a person who has the ability to patiently think though a problem and develop a creative solution. Humans have cognitive abilities that extend far beyond the finite realm of computing, and we should not deprecate those abilities. Who knows…while staring at a progress bar somebody might have an ah-ha moment, and discover a new game-changing idea or innovation that could once again transform the world. I realize that some might consider this to be too idealistic. I’m sure some readers are thinking “a game changing idea coming from some guy zoning out looking at a progress bar…yeah right!” While I’m sure I can’t change your mind, I’ll just add that I have had some really significant ideas develop while zoning out to a progress bar. In fact, many parts of this website were conceived while downloading HD episodes of the “Engadget Show” whilst zoning out to the progress bar. Whether you agree, disagree, or think that this article is pure rubbish…I’d love to hear your thoughts on the subject. Internet Bandwidth Caps, Corporate Power, and Consumer Rights. While I want to maintain this site’s political neutrality, I think that this issue is just too important to ignore. If Canada wants its citizens to be increasingly competitive in the global community then these extra internet bandwidth charges must be eliminated. The two main internet service providers in Canada (Bell, and Rogers) would forsake Canada’s technological innovation/development in order to make even larger profits from their customers. Extra Bandwidth charges being levied on consumers helps to insidiously eliminate net neutrality in Canada. I’m sure that you’re thinking “how does additional bandwidth charges effect net neutrality?” Suppose you have an internet service plan, and you are limited by a bandwidth cap of 75 gigabytes (included in your monthly fee). You would then be subject to additional charges of 1-4 dollars (per gigabyte) if this 75 gigbyte limit is exceeded. Knowing this, you will be more cautious about what kind of content you view online, and this will effect how you are able to use the internet. With more Canadians consuming content and watching video online on Youtube, Netflix…etc, consumers will limit what they watch and how much they watch from the fear of financial reprisals imposed by their internet service providers. Bandwidth caps hinder the amount of content that can be viewed online and stands in direct opposition to the provisos of net neutrality. Online video is not the only thing effected by bandwidth caps. If you consider that modern operating system updates–downloaded from the net–can exceed 1 gigabyte in file size, this could become financially problematic for consumers. For example: suppose you have to download a critical system update and you are already at your bandwidth limit for the month…you will have to pay your service provider for extra bandwidth in order to download said update. If you need several critical updates the cost could become exorbitant. *It could be said that internet service competition in Canada has always been an illusion because Bell and Rogers own the main networks used to access the global internet. The small ISPs are merely re-branding and reselling Bell’s/Rogers’ internet service. †Addendum: I have removed the petition that was embedded into this site. If you are still interested in helping stop bandwidth limits in Canada please visit theOpenmedia.ca website.